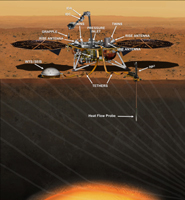 Update March 9, 2016: NASA has set a new launch opportunity, beginning May 5, 2018, for the InSight mission to Mars. 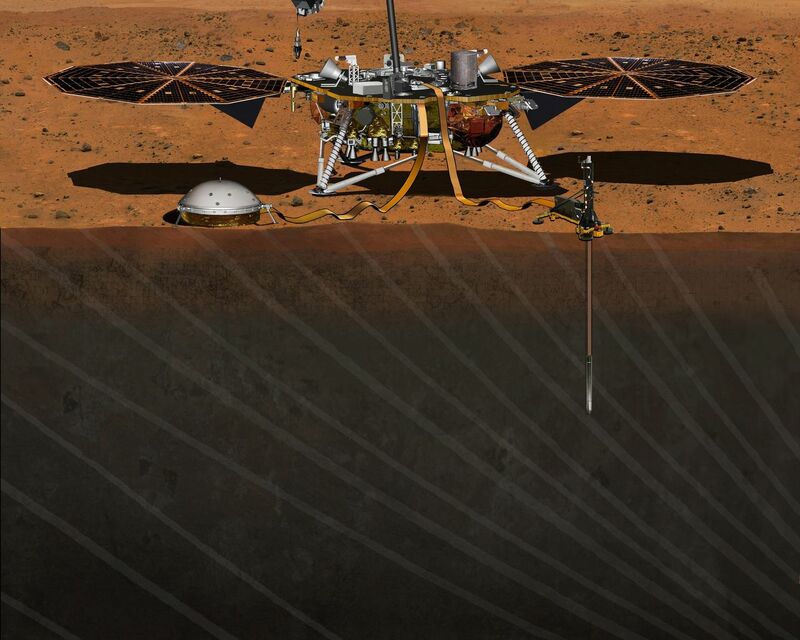 InSight is the first mission dedicated to investigating the deep interior of Mars. The findings will advance understanding of how all rocky planets, including Earth, formed and evolved. This artist's concept depicts the InSight lander on Mars after the lander's robotic arm has deployed a seismometer and a heat probe directly onto the ground. 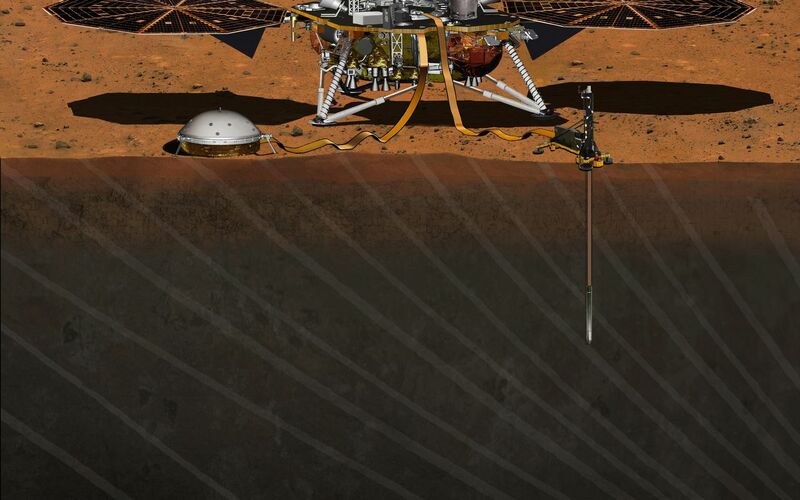 This artist's concept from August 2015 depicts NASA's InSight Mars lander fully deployed for studying the deep interior of Mars. 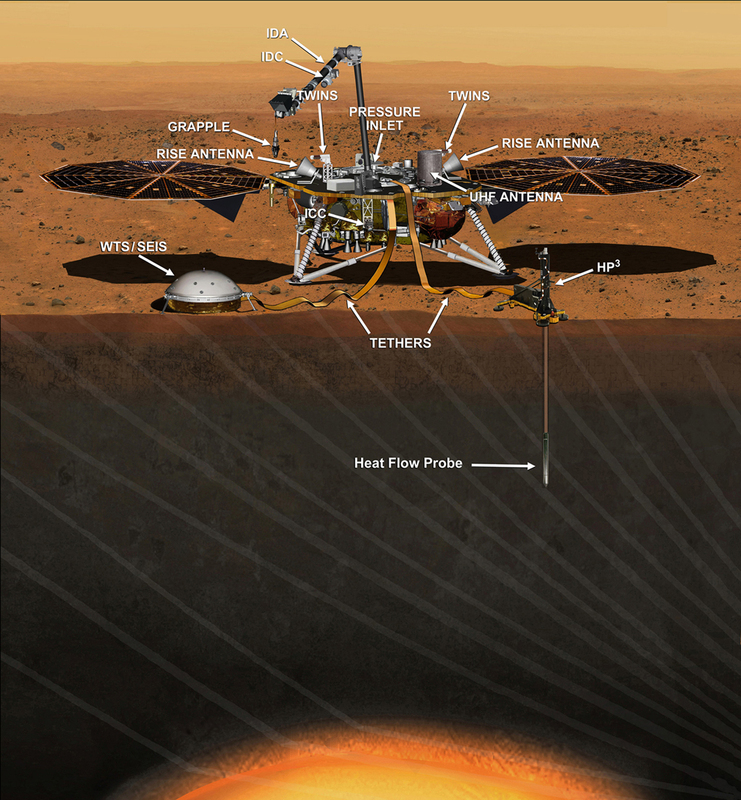 This illustration updates the correct placement and look of Insight's main instruments. For an earlier artist rendition, see PIA17358. 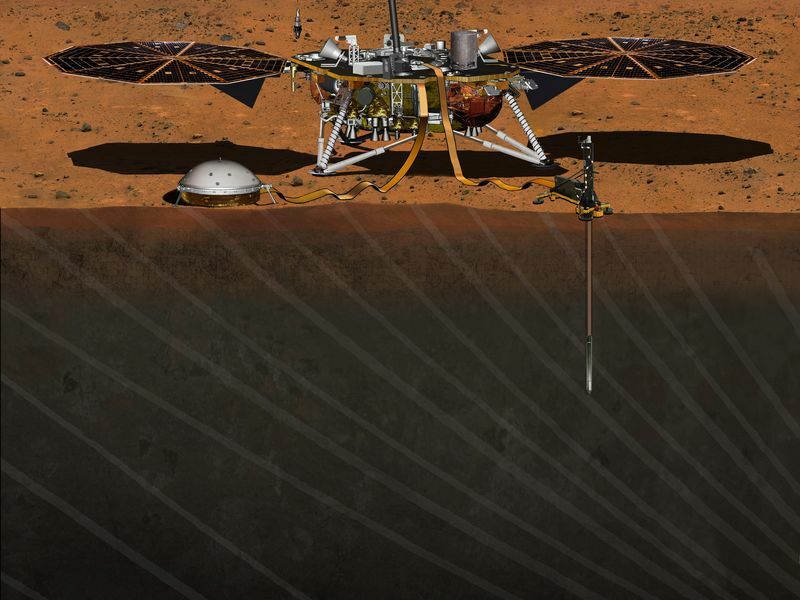 InSight, short for Interior Exploration using Seismic Investigations, Geodesy and Heat Transport, will investigate processes that formed and shaped Mars. Its findings will improve understanding about the evolution of our inner solar system's rocky planets, including Earth. The lander will be the first mission to permanently deploy instruments directly onto Martian ground using a robotic arm. The two instruments to be placed into a work area in front of the lander are a seismometer (contributed by the French space agency Centre National d'Ã‰tudes Spatiales, or CNES) to measure the microscopic ground motions from distant marsquakes providing information about the interior structure of Mars, and a heat-flow probe (contributed by the German Aerospace Center, or DLR) designed to hammer itself 3 to 5 meters (about 16 feet) deep and monitor heat coming from the planet's interior. The mission will also track the lander's radio to measure wobbles in the planet's rotation that relate to the size of its core and a suite of environmental sensors to monitor the weather and variations in the magnetic field. Two cameras will aid in instrument deployment and monitoring the local environment. Lockheed Martin Space Systems, Denver, is building and testing the spacecraft. 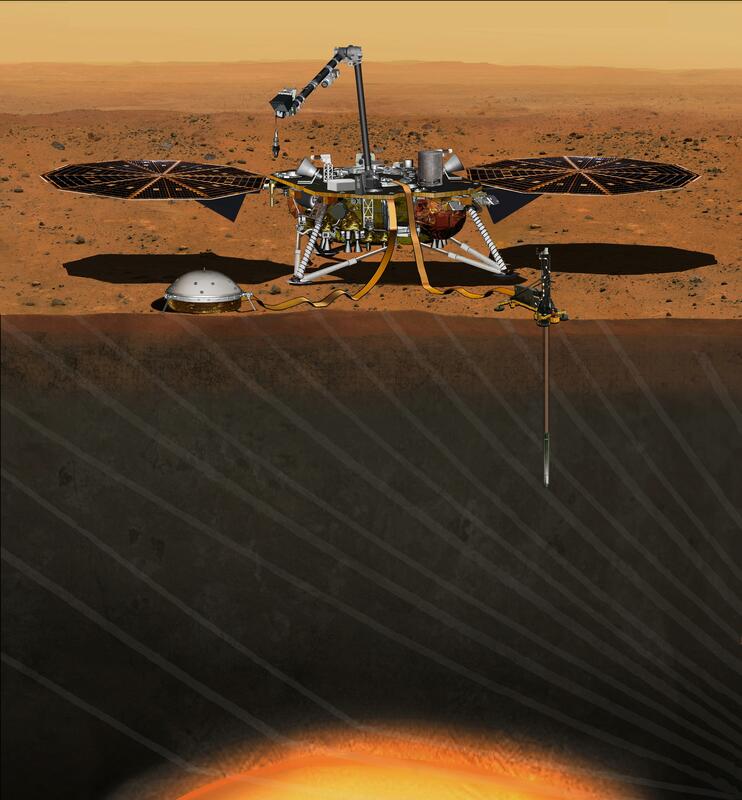 InSight is part of NASA's Discovery Program of competitively selected solar system exploration missions with highly focused scientific goals. NASA's Marshall Space Flight Center in Huntsville, Alabama, manages the Discovery Program for the agency's Science Mission Directorate in Washington. NASA's Jet Propulsion Laboratory, a division of the California Institute of Technology, Pasadena, manages InSight for the NASA Science Mission Directorate. For more information about InSight, visit http://insight.jpl.nasa.gov. Additional information on the Discovery Program is available at http://discovery.nasa.gov. Photojournal Note: Also available is the full resolution TIFF file PIA19811_full.tif. This file may be too large to view from a browser; it can be downloaded onto your desktop by right-clicking on the previous link and viewed with image viewing software.